I was curious, very curious. The idea of creating an opera that willingly rejects the need for meaning intrigued the lyricist in me. As a songwriter, meaning is not necessarily the only tool or goal you have to play with. Sometimes evocation is enough to create the impression of an emotion. So what to make of a lyrical work that totally abandons the need for meaning? That shrugs off narrative? “To be Sung” is an ambitious piece. “I wanted to write something amniotic, extremely sensitive, that situates listening within an almost metaphysical feeling of understanding through light, that demands to be heard through the mystery of the eye.” Thus spoke composer Pascal Dusapin about his third opera, a musical translation of texts by modernist Gertrude Stein produced by the Monnaie opera house but shown at the Flagey centre. Stein wrote the texts in a stream of consciousness style, apparently charting the impressions and emotions of moments with her life partner. But am I giving too much away? Does this count? The texts come from her piece, “A Lyrical Opera Made By Two (To be Sung)”. Despite the apparent abandon of the text, everything about this piece feels studied, almost painfully so. Minailo, known for his experimental work, has created a vast open feel, dominated by a large monumental centrepiece. The chamber orchestra is off to the side. 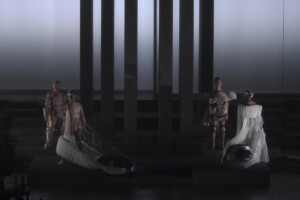 Three plus one characters amble about the stage, three in white gowns seemingly dragging parachute packs. A fourth dances occasionally. The staging and movements around the stage look deeply symbolic. We were supposed to fill in the gaps, interpreting it in ways that are appropriate to our frames of reference. To a degree, this is what happens in many operas anyway. The combination of music, acting, sets and lighting can be significant in different way to different people in the same hall. But inevitably it again begs – sorry to come back to it – the question of meaning. On the one hand, what does “Be Bop a Lula” mean? The words help, but the emotional impact owes more to the singing than a literal reading of the lyrics. What does the last section of Richard Strauss’ “Daphne” mean? The long instrumental is punctuated by vocal trills. Is there a “meaning”? Yet both examples come with a context and structure that bring a clear emotional baggage. This was not Minailo or Dupasin’s intention with “To be Sung”, who both focus on creating a soundscape with voices. The aloofness was further increased by a male voice reciting parts of the text in a flat voice, pretty much randomly. The result? I was completely detached from the piece at all times, left to admire the acoustics of the Flagey hall and conductor Bassem Akiki’s careful work with the musicians and singers (Marison Montalvo, Allison Cook and Judith Gauthier). Yet just as “To be Sung” is not about narrative, nor is it about individuals. The three sopranos are so close in tone as to be almost indistinguishable. So I left the hall pondering all these things. My personal takeways? Stream of consciousness does not necessarily mean random, and it most certainly does not mean devoid of emotion. It seems like a strange exercise to clinically remove the personal aspects from what is already such a challenging piece. To be complete, a more literal version of “A Lyrical Opera Made By Two (To be Sung)” was produced in the US in a tone closer to a musical, with music by William Turner.